ISRAEL Any map of Palestine will show the current political status of Israel in the region is exactly as it was thousands of years ago. They are in a constant state of alert, and survival. The map of Palestine above shows Israel surrounded by enemies on all sides, and stands alone in political circles of the region. The situation has not changed in thousands of years. Click on a link to view that map. It is quite a remarkable achievement for a country of 5.8 million people to maintain their sovereignty amidst such conflict. Israel was re-established in 1948, and the population has steadily grown since. The tiny nation stretches 290 miles from north to south, and 85 miles at its widest. Israel's government can be labeled as a parliamentary democracy. Israel possesses a legislative, executive, and judicial branch of government. The President resides as Head of State. He serves mostly as a figurehead for Jewish unity. The Knesset is Israel's 120-member parliament. This parliament consists only of one legislative chamber. This chamber operates in full sessions, and through 14 standing committees. The cabinet of ministers is responsible for overseeing the internal and foreign affairs. This cabinet is headed by a prime minister, and is directly accountable to the Knessett. Though a small region, the map of Palestine is littered with different geographical regions. The Coastal Plain runs right off of the Mediterranean coastline. The coast produced few natural harbors. In fact, the coastline was mostly sand dunes and hard limestone ridges, thus uninhabitable. As a result of these geographical features, these people were not great seafarers. Ancient Israel only occupied parts of this area in times of military and political might. The Jezreel Valley is considered by many to be an extension of the Coastal Plain. It is a very important feature of Palestine geography. Ancient routes permeated the Jezreel, making it a strategic location in Palestine. The valley's strategic importance can be seen on any map of Palestine. It led to the heartland of Canaan, and sat amidst influential trading routes. Great cities in antiquity, such as Megiddo, and Ibleam, sat in this valley. These cities guarded passes through Mount Carmel, thus they were of strategic interest. The valley was fed by numerous springs, and produces an abundance of crops. Barley and wheat are the specialized crops of the area. The valley will occasionally flood, and can create marshes. 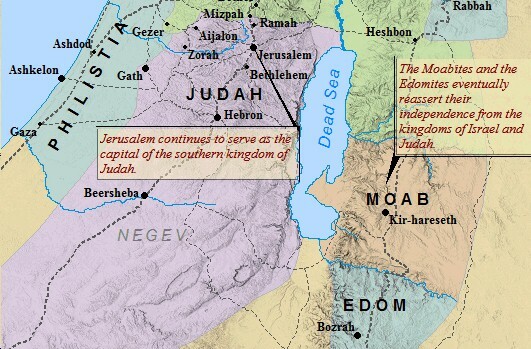 The major area in Biblical history concerns the Western Mountains. This mountain range stretches the length of Palestine. Only the Jezreel Valley interrupts this chain. The Western Mountains range anywhere from 1,500 to 4,000 feet in height. These mountains divide the map of Palestine into three regions: from south to north these regions are; Judah, Samaria, and Galilee. It is our wish to provide you with relevant and insightful material for your purchase through our various advertisers. We hope you find these resources valuable and helpful! Karen Farrington's recent works include Historical Atlas of Expeditions, Historical Atlas of Empires, and Historical Atlas of Religions. The Historical Atlas of the Holy Lands is a comprehensive account from a biblical, archaeological, and sociological perspective of the entire region. THE NORTHERN TEN TRIBES OF ISRAEL FORMED THEIR OWN KINGDOM AFTER THE DEATH OF SOLOMON, CALLED ISRAEL. THE KINGDOM OF JUDAH FORMED IN THE SOUTH CONSISTING OF THE TRIBES OF JUDAH & BENJAMIN. The tribes of Israel derive from the eleven sons of Jacob. Jacob was renamed by God, Israel. 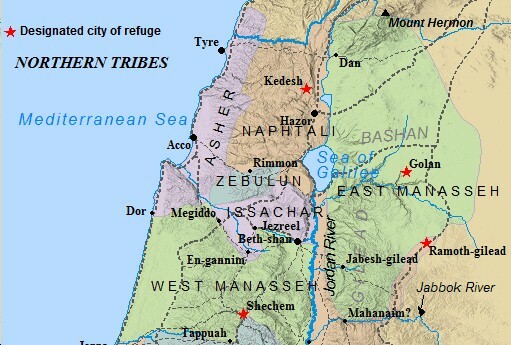 The tribes of Galilee are Asher, Issachar, Naphtali, and Zebulun. Twenty cities from Asher were given to Hiram by Solomon, in exchange for laborers and goods for the Temple. Mount Tabor lies on the border of Zebulun, Issachar, and Naphtali. The three tribes shared worship places on and around the mountain. EAST MANASSEH OCCUPIED LAND EAST OF THE JORDAN, WHEREAS WEST MANASSEH LIE TO THE WEST OF THE JORDAN, IN THE JEZREEL & GALILEE. MOSES & THE ISRAELITES CONQUERED THIS LAND EAST OF THE JORDAN FROM OG & SIHON, THE BROTHER WARLORDS OF ANCIENT CANAAN. 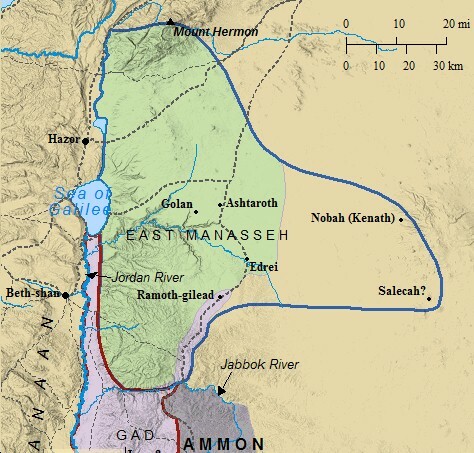 The Trans-jordanian tribes consist of Reuben, Gad, and Manasseh. 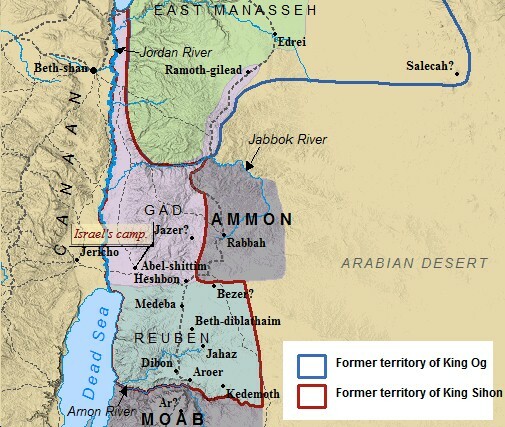 After the defeat of Og (map to the right) and Sihon , the elders of these tribes asked Moses to deed this area to them. Moses complied, on the condition they would continue to support the remaining conquest. The tribes of Joseph were the two most powerful northern tribes. The tribes of Ephraim and West Manasseh received blessings from Jacob and Moses. A map of Palestine shows the Northern core consisted of these two tribes. Every capital of the northern kingdom of Israel was in Manasseh; Shechem, Tirzah, Samaria. Ephraim possesses a fertile agricultural region. This region produces an abundance of vineyards and orchards. Manasseh battled Canaanites throughout its existence, as it was unable to drive them completely out of their allotment. Coastal cities, such as Dor, and the important city of Megiddo, remained in Canaanite hands until the time of David. The map of Palestine was never completely cleared of Canaanite presence throughout the history of Israel. 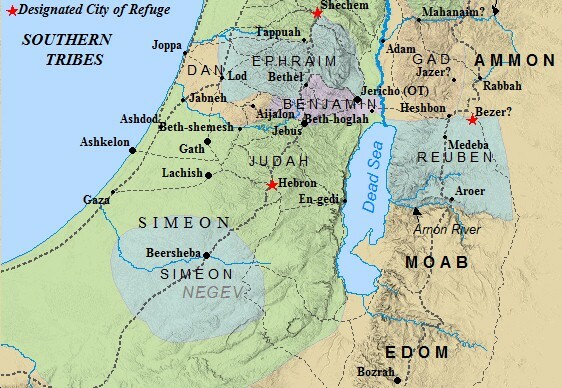 The Southern tribes consist of Judah, Benjamin, and Simeon. It's capital city was Jerusalem . The southern Kingdom outlasted the Northern Kingdom, before falling prey to the Assyrians as well. Benjamin lay in the central highlands, bordering much of Ephraim. Jericho lie within the tribal allotment of Benjamin. The Central Ridge Route ran through Benjamin's territory, thus giving it control of a vital link in the region. Judah produced the Davidic dynasty. She lay in the southern portion of the Western Highlands, or sometimes referred to as the Hill Country, or Hill Country of Ephraim. A look at a map of Palestine will show Judah was cut off geographically on three sides. Rarely did Judah exert total influence in the area. 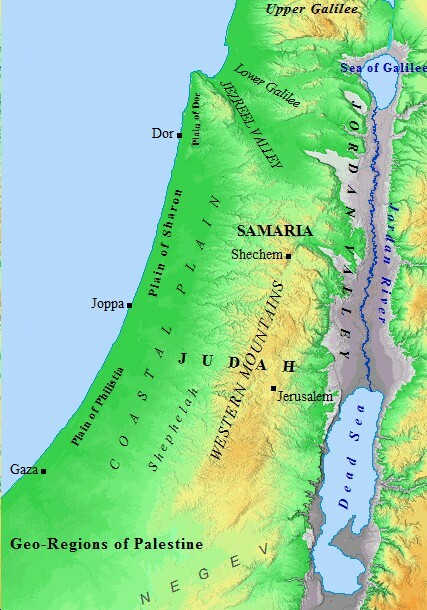 The Shephelah rarely came under Judean control, and Philistia remained independent throughout much of the Old Testament. The last southern tribe was the tribe of Dan. Dan, however, was driven from their original land by Canaanites. They were forced to relocate to north of the Huleh Basin, southwest of Mount Herman. The southern kingdom of Judah was more isolated than the northern kingdom of Israel. Consequently, Judah's trade links were less extensive than Israel's. A MAP OF THE SOUTHERN KINGDOM OF JUDAH. THE TRIBE OF SIMEON WAS ABSORBED BY THE LARGER JUDAH, THE TRIBE OF DAVID & THE ROYAL TRIBE OF ISRAEL. Judah's strength, however, rested in its continuity. Save for one, every ruler came from the line of David. This gave Judah a sense of stability other kingdoms envied. Deep rooted tribal traditions and loyalties were the foundation of Judah's throne. Though much smaller in size and strength than Israel, Judah was able to survive 130 years longer because of this. The first king of Judah was Rehoboam II. When Israel fell to the Assyrians in 722 B.C.E., Hezekiah was king of Judah. His ascendancy to the throne is debated, but dates range from 729 - 687 B.C.E. Hezekiah implemented religious reform and political freedom from Assyrian threat. THE KINGDOM OF JUDAH WAS SURROUNDED BY ENEMIES ON ALL SIDES - MOAB, EDOM & PHILISTIA. CONFLICT WAS CONSTANT IN ANCIENT ISRAEL. A quick glance at any map of Palestine will draw one to notice the diversity of the region. 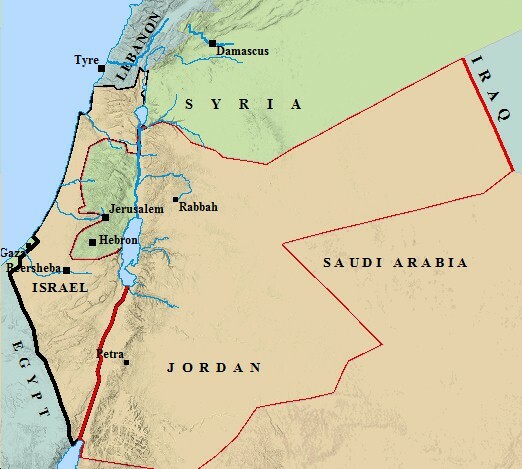 Geography varies widely, from the deep River Jordan Valley, to the Western Mountains, stretching to the Coastal Plain. Palestine is also a diverse region ethnically. This diversity has led to much bloodshed over the years, and continues to this day. Do you live in Palestine? Have you visited before? Share your thoughts, comments, and questions by clicking on the link above! Any student of the Bible needs their own map. Geography is essential to the history of Israel. Click on the link below to be re-directed to the appropriate site. Purchase your map of the Modern Political Divisions of Palestine!